If you are just getting started with Dwellicious we recommend you start by first adding a Dwellicious bookmarklet on your browser. Then learn how to create a bookmark. Soon you'll be bookmarking properties all over the web! Happy house hunting! Q. What are the browser requirements for Dwellicious? Q. I forgot my password or my username, help! A. To retrieve your password visit the password reset page. If can't remember your username email us at support. Q. How do I delete or cancel my account? A. Currently you must request this by contacting support. Dwellicious Pro users must cancel under the "Account" tab from "My Dashboard". A. There is no easy way of doing this now. So you will have to cancel your account and start a new account. A. Dwellicious is a social bookmarking site for people to organize, share, and discuss the search for their next home. Dwellicious is a combination of the word “dwelling”, meaning home, and “delicious” meaning yummy! Q. How will Dwellicious help me find my next home? Simply bookmark and organize real estate listings from popular real estate websites. Share your bookmarked listings with others. Track and update your bookmarked listings. Discuss bookmarked listings with others. We also give you a set of tools such as mapping, neighborhood info, school info, property valuation, and recent area home sales to help you with your decision-making. Like other social bookmarking sites your bookmarks will be stored on the web, not your computer, and dwellicious lets you tag bookmarked listings to help highlight feature about each listing. Because bookmarks are stored on the web you will be able to see what others have bookmarked and tagged. Dwellicious then goes a step further; due to the dynamic nature of real estate data you will also see any changes made to bookmarked listings. Changes could be on price, whether the property is off the market or maybe new photos were added. When all your favorite homes are in one place, it’s easy to discuss with others (maybe your spouse, parents or real estate agent?) what you like or dislike about each home. Q. I'm a seller, how can Dwellicious help me? A. Great question! Dwellicious is a great tool for Sellers who want to keep track of their competition. Dwellicious "smart" bookmarks keep track of important information on bookmarked properties such as changes in price or whether a property has gone off the market. So many Sellers find it usefull to search for homes that are similar to theirs and bookmark them in Dwellicious. Doing this means from one place you can monitor these homes without having to got back to each real estate web site everyday or get email alerts that just fill up your email inbox. And of course since you are selling your home, you can use Dwellicious to help you organize, share and discuss the search for your next home! Q. I'm a real estate agent/broker how can Dwellicious help me? A. We have a special version of Dwellicious made for real estate professional. We call it Dwellicious Pro and you can sign up for a free trial. Q. What real estate sites work with Dwellicious? Keep in mind, when you add a bookmark to your Dwellicious account, we will index and recognize relevant details from these sites. Bookmarks that are not from these sites will not contain details, nor will they be updated when those details change. You must also remember that to only bookmark properties when you are at the property detail screen, not when you show a list of properties. Don't see your favorite site? Request that we add it by e-mailing siterequest at dwellicious dot com. Q. How do Dwellicious "smart" bookmarks know that the price has changed, or the home is off the market? People are mostly interested in the listings themselves, not just the website. Listing information tends to change - price, status, adding new photos, etc. So we needed to create bookmarks that could index specific data about a particular listing on a website. And we needed to make sure that the bookmark knew if any of the changes were made and when. In a traditional bookmarking scenario you are just bookmarking a site because it's cool, useful, and you want to visit again. But when you bookmark a real estate listing, that listing might not be there next week or the price might have dropped. What we needed was a "smart bookmark" and that's what we created. Q. How do I request to add a real estate website to work with Dwellicious "smart" bookmarks? A. Email us at siterequest@dwellicious.com. Q. How do I make my bookmarks private? A. Bookmarks can be made private when you first create a bookmark. Or when you are editing your bookmarks you can make them private. Q. Can I select who can see my bookmarks? A. Currently your bookmarks are either made public or private. Q. How do I edit or delete a bookmark? A. From your bookmark page each bookmark includes an "EDIT" and "DELETE" link. Q. How do I share my bookmarks with others? A. When you create a Dwellicious account you have a personal URL, which would read http://Dwellicious.com/YOUR USERNAME. 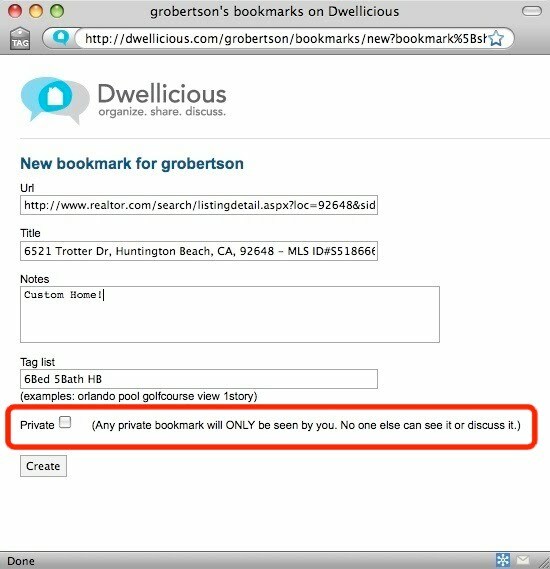 Just tell your family and friend your Dwellicious URL and they can view your bookmarked properties. Q. Can I change the display order of my bookmarks? A. Bookmarks are displayed in the order of recent changes/additions. Bookmarks that have been recently updated or added are at the top. Currently this cannot be changed. A. Tags are one-word descriptors, usually a feature of the property, that you can assign to your bookmarks on Dwellicious to help you organize and remember. You can assign tags to as many bookmarks as you would like and you can always delete or rename the tags later. Q. How do I sort my bookmarks? A. Tags are a great way of filtering your bookmarks. Just click on the Tag use filter. In the example below only bookmarks that have been tagged with "4beds" will be displayed. To unselect a tag, click on the "circle with an x" graphic, to the right of the tag name. Q. Can I create a bookmark for non-real estate sites? A. Yes. You can create a bookmark for any website, just as you would for a property. Just visit the website and click on your "Add to Dwellicious" browser button. Below is an example of a bookmark that goes to the New York Times website. Keep in mind you might have to press refresh in your browser when you create a new bookmark. Q. How do I post my bookmarked properties to Facebook? Q. How do I post my bookmarked properties to Twitter? Q. What are "Cool Tools"? A. Together with Google, Zillow, Cyberhomes, Education.com, Frontseat.com, Facebook and Twitter we've put together a mash-up of decision making tools to help you analyze your bookmarked propeties. Q. Why isn't there a Street View of the property? Q. How accurate are the Valuations in Cool Tools? A. Dwellicious believes that a licensed real estate professional should be contacted to provide additional information and analysis for a more accurate estimate of this property's value. A. This is real estate industry lingo for "comparative properites", or recent home sales in the area. Q. Where do the "area photos" under the Media tab come from? A. Dwellicious uses photos submitted by users of Panoramio. Panoramio is a Google company that lets photographers upload photos and post them to Google Maps. Since Dwellicious knows the bookmark property address we can ask Panoramio to display area photos within a close distance to the bookmarked property. Q. What should the "History" tab display? A. The History tab will keep track of any updates made to this bookmark. Updates include price changes, new photos added, or whether the propertie went off the market. Q. How do I get support for Dwellicious?